This adorable Golden Labrador is a prototype for an innovation called Tombot, a companion robot currently in development. Tombot founder and CEO Tom Stevens told Digital Trends that the company is “focused on filling the emotional void for those cannot safely or practically care for a live animal.” The robotic pets are capable of performing many of the same actions as real dogs, such as “breathing,” responding to when their names are called, and wagging their tails. The Tombot could revolutionize mental health care, easing problems associated with loneliness, dementia, anxiety, and depression. And robotic companions don’t need food, walks, or expensive veterinary care which make them an affordable and low-maintenance choice for people who would have difficulty caring for a real pet, especially aging seniors. Many studies have indicated that interaction with animals leads to higher mood levels and better quality of life for seniors. 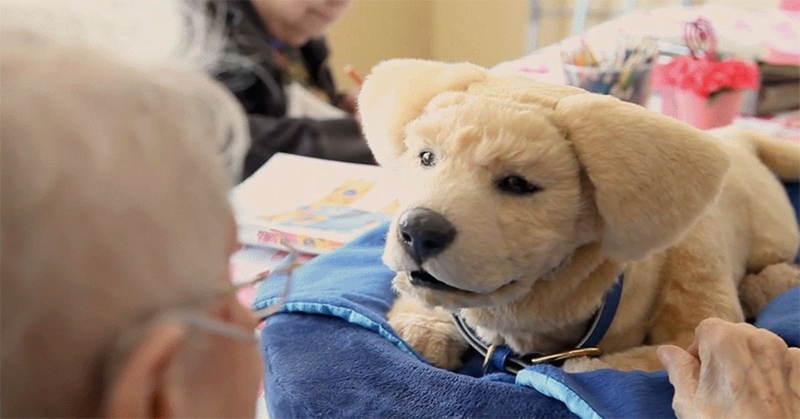 Tombot’s creator, who developed his innovation after his mother had to give up her dog after an Alzheimer’s diagnosis, hopes the same will be true for realistic robotic pets.